Synopsis: Resident Kristin Hoffman developed a curriculum to aid parents in providing proper nutrition for their families! Kristen facilitated a FREE nutrition class along with two UC Davis Dieticians at the Tahoe/Colonial Collaborative for local families. 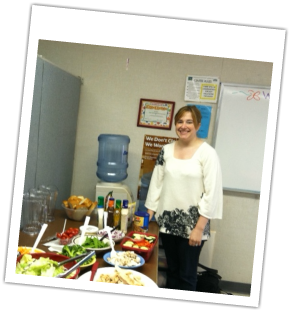 She also provided a fabulous salad bar equipped with dozens of healthy salad topping options! Families gathered at the TCC and shared in a fun night of education and healthy food while raising awareness of the importance of proper nutrition at home!